I just wanted to say hello and tell you thank you for saving my life. The 6-day intensive week was the hardest thing I have ever done but the best. Thank you. Just. Go. You’ll be glad you did. 5 Day Intensity to clean inside and be grateful for who you are becoming. I am so grateful to have attended the 6 day in August. It was a once in a lifetime opportunity to get the tools and insight I needed to make the changes in my life and face my addiction to food with the 12 steps. Shades of Hope is doing amazing work and saving lives. Tennie Mcarty and her staff are incredibly knowledgeable, kind and incredibly gifted in what they do on a daily basis. Having gone through the 5 Day intensive workshop in June, I can honestly say that it’s the best money I’ve ever spent. The experience was lifechanging and I will be forever grateful for the opportunity to work with the best addictions therapist in the US if not the world. The past year has seen some amazing changes and tremendous strides. Kathy and myself have been doing awesome work with the AL-ANON program. We have served as speakers at our local rehabilitation facility and also become involved in our support groups. Wow, has life changed! Allie has become a human again. There is no longer a walking dead look in her eyes. Her growth is something that only you could have seen in others that have walked through your rehab facility. She is now so involved in AA that her life revolves around it. 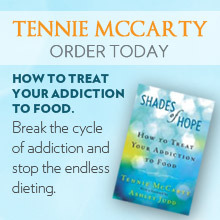 She has started a much needed eating disorder program our local AA facility. The program utilizes the 12 Step Program and has become a success. There are only two meetings a week, but that is quite a change from zero. She is also a sponsor of a few ladies in AA. I also bought a house next to our flower shop and had intended to rent it out to a family. That fell through and Allie asked if she could use it as a sober house. We hashed it out a deal. She had to come up with a contract for all the girls to abide by, and I would only supply the house and collect the rent. She made a connection through the local rehab facility that we used for her intervention and now has a steady supply of tenants. She has changed so much since the endeavor. She has matured. We as a family finally had a Christmas season again after being emotionally dead for the past two Christmases. Oh, I could go on and on with how our lives have become filled with joy, but what I want to say is THANK YOU!! !